A shaped back adds a cool look to this slipper accent chair. It's a fun way to add extra seating and updated style anywhere with in your home, whether it is your living room, a bedroom, or office. 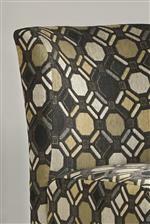 The bold, contemporary fabric is a geometric pattern with beige and gray tones. 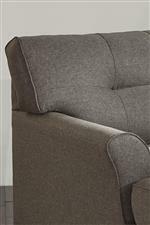 The Tibbee Contemporary Slipper Style Accent Chair by Signature Design by Ashley at Walker's Furniture in the Spokane, Kennewick, Tri-Cities, Wenatchee, Coeur D’Alene, Yakima, Walla Walla, Umatilla, Moses Lake area. Product availability may vary. Contact us for the most current availability on this product. Make a statement in your living room with your choice of pieces available from this contemporary collection. Heathered gray fabric complements bold geometric accent fabrics for a sophisticated look and feel. The Tibbee collection is a great option if you are looking for Contemporary furniture in the Spokane, Kennewick, Tri-Cities, Wenatchee, Coeur D’Alene, Yakima, Walla Walla, Umatilla, Moses Lake area. Browse other items in the Tibbee collection from Walker's Furniture in the Spokane, Kennewick, Tri-Cities, Wenatchee, Coeur D’Alene, Yakima, Walla Walla, Umatilla, Moses Lake area.